And now for something completely different. This skirt really is a departure from what I normally wear. But I'm branching out. I usually feel like full, pleated skirts are best suited for those with tiny little nipped in waists. My waistline changed dramatically post baby. I mean, I know it does for most everyone. But I ended up with quite a large difference in my waist measurement. Not anywhere else, though. Just the waist. In fact my bust measurement went down a teeny, tiny bit-- womp, womp. Hip measurement is the same. The change in waistline very much changes my body shape. And it's been interesting trying to figure out what works and what doesn't now. I've been avoiding fitted waistlines just for that reason, in case you haven't noticed. I do love a good billowy tunic or a swingy tee. I always have and I always will. But I think it's time to work my way back to some fitted waists. Anyway, despite my own body issues, I really like this skirt. This is Butterick 5929, a full, pleated skirt with pockets. I made view A, the one with no waistband. I love the lack of waistband on this. I am surprised I like it so much, but I do. 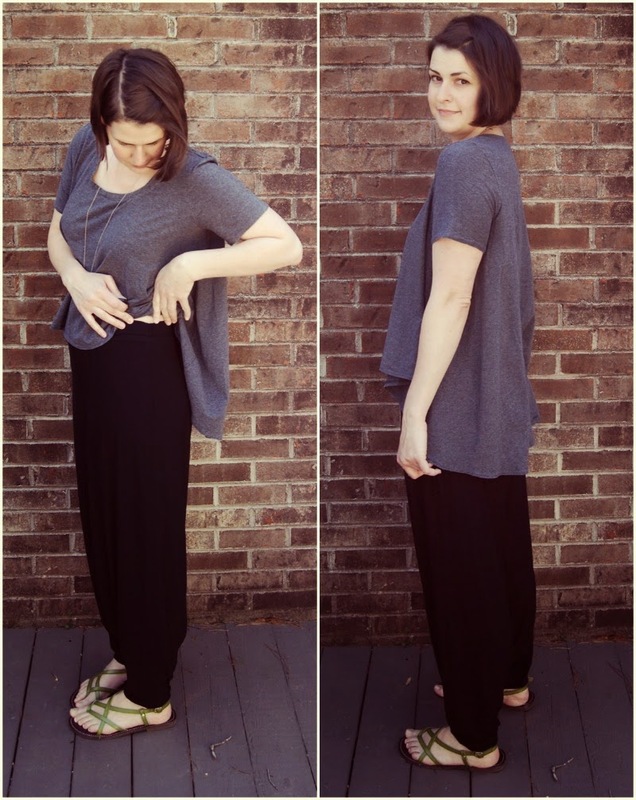 I measured myself carefully and chose a size 16 based on my hip measurement. But I did end up taking in the waist about a half inch on either side. If I made a 14, it probably would have been too snug. So I guess I really needed a size 15- ha. It's a nice little pattern. The front is paneled. I assume to help with cutting layouts. There are four pleats on the front and four on the back. The pattern instructions have you baste the pleats down while sewing the skirt and then remove the basting later. I removed all the basting stitches when I finished and decided I preferred the back pleats stitched down. So I stitched those down but left the front pleats free. Despite the fact that this silhouette is not usually my style, linen skirts are totally my jam. And yes, I will always wear it slightly rumpled, just like this. 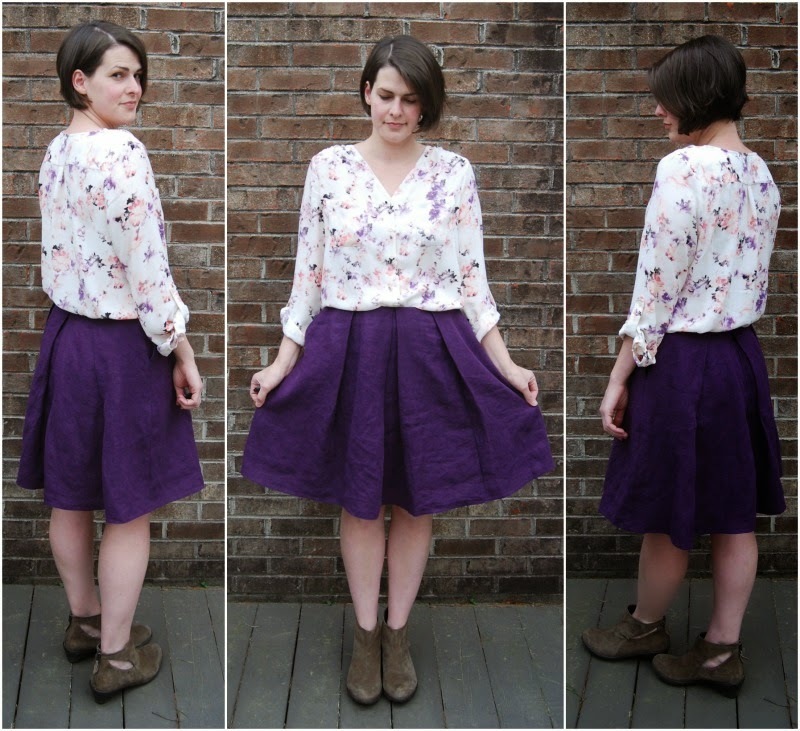 Making this skirt in linen made it feel more like me. I used a pretty purple linen I had stashed. It's a perfect grape color. Purple! I can't remember the last time I wore anything purple. I desperately wanted to put a filter on these photos since I am so incredibly washed out and pasty right now. But I didn't so you could see the actual color of the skirt :)- This is what I wore on Easter. I did a regular dress zip for the first time in ages. I planned to do an invisible zip but couldn't find a match. I serged all the seams inside the skirt. I didn't want to purchase four cones of purple serger thread, though. Not a color I use very often. 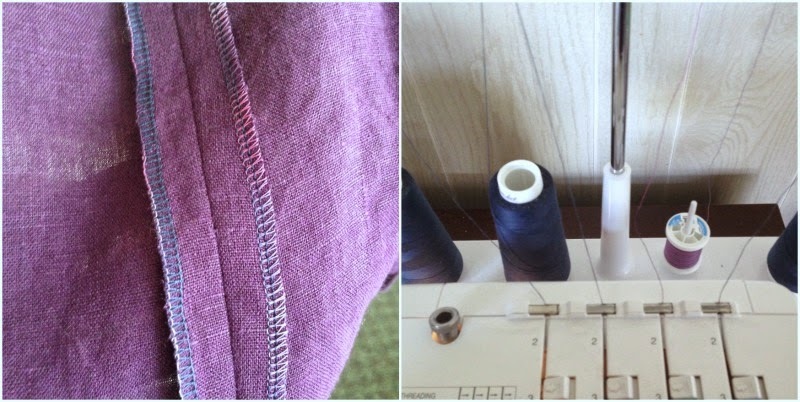 So I bought a spool of variegated purple thread and put it in the upper looper on my serger instead (I used my navy cones for the rest). I love how it looks inside. Although from this photo you can see that I should have put one in the lower looper as well. Or serged all my pieces right side up. Anyway, this is an ode to Heather's awesome rainbow serger thread. I really need to order some rainbow thread for my serger. All in all, I am very happy with my pleated skirt. I am thinking I want to make it again. I have a fabric in mind but it is much stiffer than this linen. It will be interesting to see how I feel about the shape then. Y'all. I made hammer pants. And I love them. And no, this is not an April Fool's prank. Now I know that these will not be everyone's cup of tea. But these pants are awesome. Awesome, I tell you! Don't hate. Whether I look like a tragic fashion victim or not, I am digging the breeze. 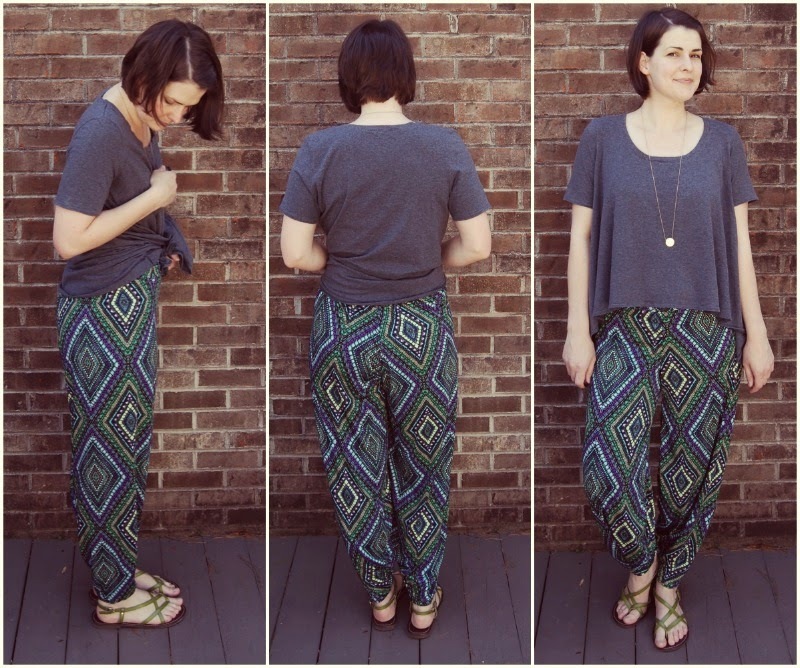 I made harem pants. I think I probably snorted my drink the first time I read that harem pants were a thing. What was that, last summer maybe? I am, like always, late to the party. I usually pick up on a trend when it's no longer cool. And to be fair, I am not a fan of the drop crotch. 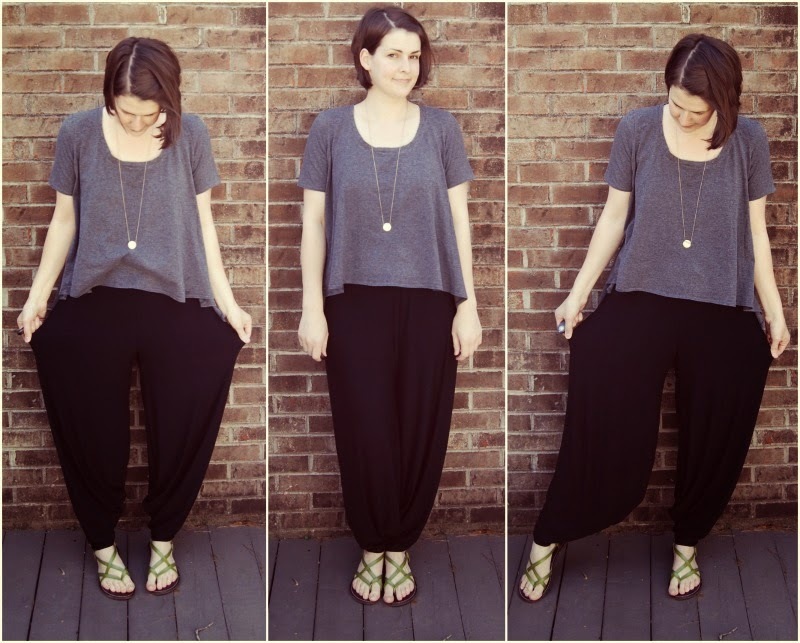 But there is something about harem pants that drew me in. I think I like the laid back, bohemian vibe. I came across this Sandra Betzina pattern (Vogue 1355) while browsing the Vogue catalog during the last pattern sale and immediately purchased it, along with a cheap poly knit to test it out. I like that this particular pattern had the drapey genie leg but without the drop crotch. This wacky version is my wearable muslin. I made no attempt at pattern placement or matching since I was really just trying to figure out if I could pull it off. The pattern placement is not too unfortunate, I think. My muslin is a size D with no changes. This pattern is dead easy. Three pieces, three major seams. There are two darts on either hip. It was a super quick sew. The waistband uses negative ease instead of elastic-- like yoga pants. After my muslin, I made the black pair out of the softest bamboo knit ever. I ordered several yards of this bamboo/rayon knit from fabric.com and I don't think I'll ever be able to use cheap knits again. This is seriously nice stuff. It is soft and drapey but also opaque. And being opaque is high on my list of priorities when making a bottom. I actually looked for a suitable knit at Joann's before ordering this stuff but everything there was too see-through. Anyway, I have already ordered more bamboo knits from fabric.com. Hopefully they will hold up over time. The only change I made to the black pair was to add 1.5 inches of length. That's it. Fun, easy pattern. In case you are wondering, both pairs are really just intended to be lounge wear at home. I am still toying with the idea of maybe wearing the black pair out and about, but I need to figure out something to wear on top. They are a little bit ridiculous, I know. J likes them. He said they bring back good memories of his zubaz pants.